A straw hats maker gets a bit carried away and his son ends up being a professional Grappa producer. Che bello! Poli was founded in 1898 in Schiavon, near Bassano del Grappa (in the hearth of Veneto, the most typical region for Grappa production), it is an artisan distillery solely owned by the Poli family. Jacopo Poli’s great-grandfather took his hobby size still door-to-door on a small cart, collecting pomaces from winemakers. Now the Poli family no longer goes door-to-door, instead, they now use an alembic still with 12 copper cauldrons. Naturalmente. 1) Repetitio est mater studiorum (this one is in Latin!). 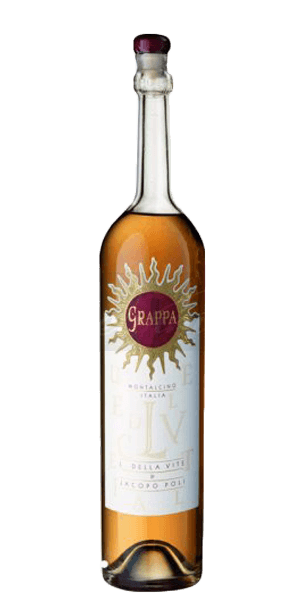 Grappa is grape-based pomace brandy of Italian origin. Fermentation and distillation must occur on the pomace (‘the leftovers’ of winemaking), no added water is allowed. 2) Italians also add Grappa to espresso coffee to create a caffè corretto, meaning "corrected coffee". Incredibile. 3) Italian law requires winemakers to sell their pomace to grappa makers; this is a measure that was taken against moonshine operations. They say it works. Sfortunatamente. What does Jacopo Poli Luce della Vite Grappa taste like? The Flavor Spiral™ shows the most common flavors that you'll taste in Jacopo Poli Luce della Vite Grappa and gives you a chance to have a taste of it before actually tasting it. Italian law requires winemakers to sell their pomace to grappa makers; this is a measure that was taken against moonshine operations. They say it works. Sfortunatamente. Luce della Vite was the first wine ever produced in Montalcino by blending Sangiovese and Merlot grapes. In 1998, Luce della Vite teamed up with Jacopo Poli to create a Grappa of exquisite quality that honours the terroir from which this outstanding wine originates. This is young-special-edition-single-vintage Grappa. Certo. It is an outstanding, intense, young-special-edition-single-vintage Grappa which has a penetrating birth; while a dry & bold life leads to a long & hot death with a hint of fruit. Quite nice as grappa goes. Reasonably smooth, but drink it at cellar temp. Very unique and interesting. There's no oak anywhere to be found. The nose is citrus, rose petals, and plum. The palate is dense thick citrus peel oil, lavender, rose, and intense licorice. A smooth finish is floral with more anise and herbs. Good but complicated. Kind of tastes like plastic and paint thinner on the after taste. The initial taste is sweet, grapes and a bit floral. Not into the after taste, though. First time trying grappa, it was very good. It smelled like shoe polish to me. Perhaps I do not have a sophisticated enough palette for this spirit. I’ll steer clear of this in the future. Maybe some will enjoy it more than my tasting party did. What a surprise. The nose is a snootful of acetate esters, but the liquid is a complex mix of sweet floral and fruity goodness followed by a nice mouthful of heat. I had the same experience. On first sniff I was sure I was about to drink something akin to moonshine. But once on the palate it really shows unique character. The first time I've tried a grappa and it was not something I enjoyed. I will probably try another grappa in the future to see if its an acquired taste or if theres other I might enjoy more. When you're tasting grappa you have to know what you're in for. Plenty of it could pass for paint remover and is barely suited to be masked in a strong espresso. But this is a well rounded sipper that tastes of the grapes. Fine stuff. Oak and anise a bit strong to start with, but still complex enough to enjoy. This grappa has a strong first flavor and once you get past it, you are left with a pleasant sweetness that is not too much. The flavor of this grappa is much more complex, but it reminds me of the flavor of high quality moonshine (high proof corn liquor specifically). Exceeded expectations. Definite acquired taste though. I could not get past the super strong first layer of flavor. The grape flavor underneath was pleasant but the strength of the first layer was too much to let me enjoy it. Surprisingly Good - its odd, but in a good way. That’s a very special grappa. Aromas are beautiful, flavor on the very suave side. Sweet. Grapey. An acquired taste. light and easy going, not the best, but not the worst. Awful. Glad I only got a sample of it. Half of that sample went down the sink. Should be called Crappa. Absolutely the worst sorority I’ve tasted. Complete garbage and a waste of money. Light on the tongue, but smells terrible, and the flavor of figs (or dates) overpowers the end. May work well with a cigar, but I'll never ever pay for this to find out. Blegh. Heavy floral and bitter notes. If you like Campari you'll probably appreciate some of the flavors. Probably the worst thing I've ever paid to consume. This is the first grappa I have had and I hated it. Tasted like somebody wrung sweaty socks out. I'm normally a whisky drinker so maybe this just isn't my taste. Doesn't overpower you with fire or flavor, unlike other grappas I've tried. Very light, very subtle. Right from the beginning this drink presented a very heavy "Oranges" flavor to me. I slowly sipped the drink in an effort to allow the proper mixing/dilution of the ice and Jacopo Poli to see if perhaps the overwhelming Orange flavor would somewhat subside. It did not and I cannot recommend this presentation. I would not purchase again. Decent. I liked how it smelled better than how it tasted. Grappa so far isn't something that I particularly like. Odd and definitely different. Wasn't my favorite. Wasn't the best on the nose but did taste better than it smelled. Had a slight heat and spicy profile to it, definitely carried itself with the consistency of a wine. Decent but just not my preference.